Col. Hanry Sherburne's Additional Continental Regiment, 1777. Continental Line, on the right the Sherburne's Additional Continental Regiment. The Col. Hanry Sherburne’s Additional Continental Regiment was raised in January 1777 by Henry Sherburne from Connecticut and Maryland recruits. 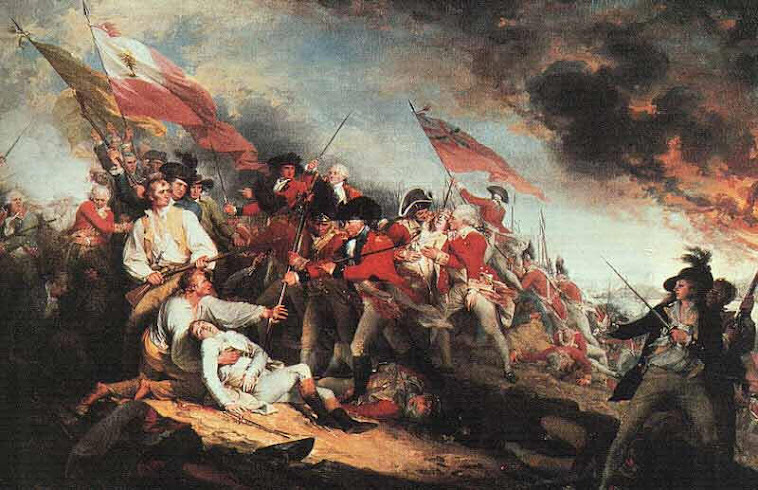 The regiment served in Connecticut 1777, throughout the Hudson Highland's, and in Rhode Island and New Jersey to 1780. 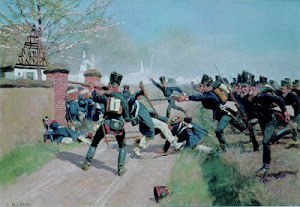 Sherburne’s unit served simultaneously in the same theaters and actions as Webb’s Additional Continental Regiment and in May 1780 was broken up, many of its soldiers grafted to Webb’s command. 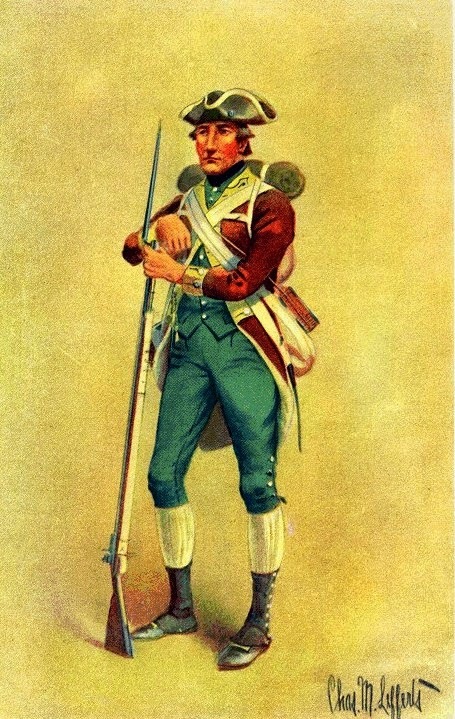 Abundant deserter descriptions all describe brown coats faced yellow and blue or green breeches. My Sherburne’s Regiment is made up of 16 figures. The soldiers are conversions of British redcoats from the Front Rank AWI range. 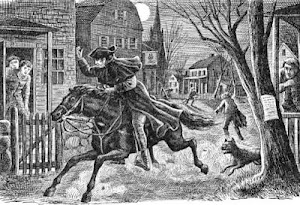 Il Reggimento Continentale Addizionale del colonnello Sherburne è stato creato nel gennaio 1777 da Henry Sherburne con reclute del Connecticut e del Maryland. Il reggimento ha servito in Connecticut nel 1777, in tutte le Hudson Highland e in Rhode Island e nel New Jersey fino al 1780. L’unità di Sherburne ha servito contemporaneamente e negli stessi teatri d’azione del Reggimento Continentale Addizionale di Webb e nel maggio 1780 è stata sciolta, molti dei suoi soldati sono confluiti nel comando del colonnello Webb. Numerose testimonianze da parte di soldati disertori descrivono giubbe marroni con mostreggiature gialle e calzoni blu o verdi. Il mio Reggimento di Sherburne è costituito da 16 figure. I soldatini sono conversioni di giubbe rosse britanniche dal range AWI della Front Rank. Dipinto da Luca Onesti (Strategia Nova). Sherburne's Additional Continental Regiment in line. View of the rear of the regiment. Sherburne's Additional Continental Regiment advancing in line formation. 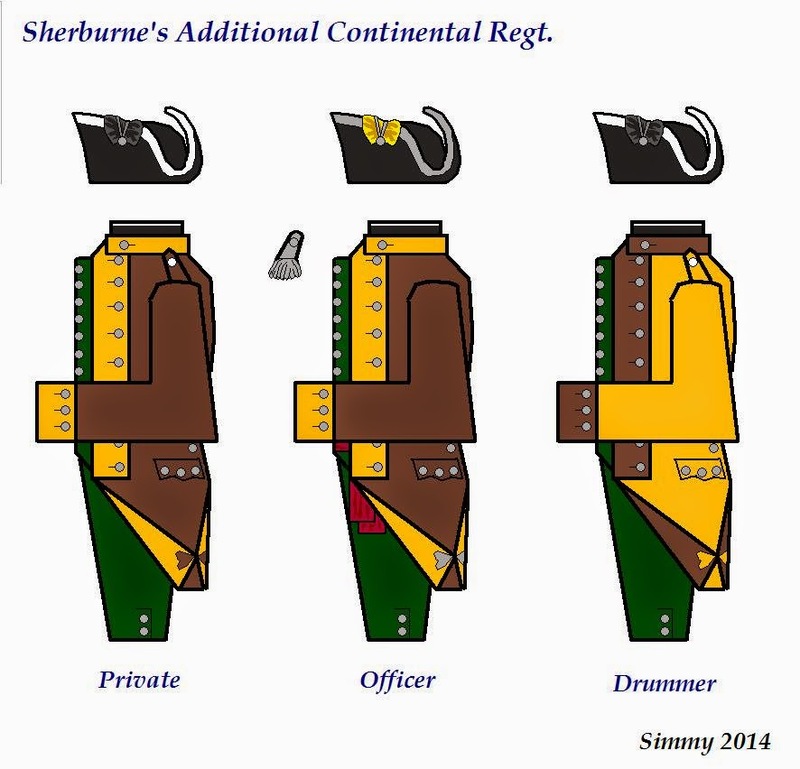 The regiment's uniform in my own illustration. i tuoi post sono sempre una fonte preziosa! Ciao Luca, grazie di seguire il mio blog così assiduamente, mi fa molto piacere sapere che apprezzi. Excellent job, Sherburne's Additional Continental Regiment is stunning! thank you so much to always follow my blog, thanks for the encouragement and advice. Hey Simmy wonderfull painted figures! What I also like is the historical information you add in the post! Hello Peter, thanks for the compliments. Although English is not perfect, I always try to add some historical information.